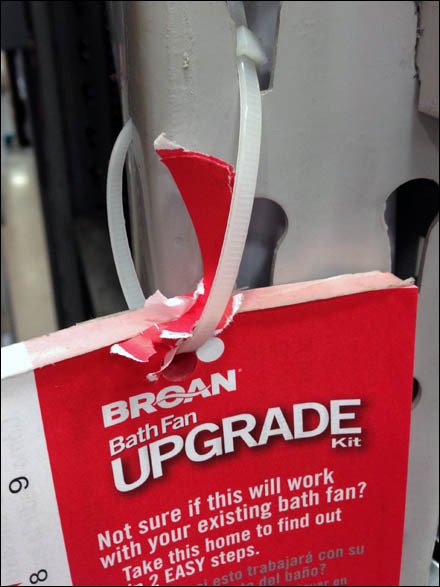 “Not sure if this will work with your existing bath fan?” asks the shelf edge promotion? “Take this home to find out in 2 easy steps.” comes a self-reply. This is a perfect approach for the woman shopper. My wife would surely pick a bath fan or other upgrade by how it looks, not size or technical requirement. A man (me for example) would start at the size and technical need, and “settle” for what fit the hole … after all men are “approximate” shoppers. This paper “tool” allows anyone to admire the fixture, then easily check for a fit. Where was this when my wife recently remodeled the downstairs bath and laundry room? She got a great ceiling light and fan fixture upgrade. But to make it work we had to shove a new fan box, plenum and duct size reducer into the ceiling. Oh well, at least we managed to reuse the in-ceiling duct line to the outside. 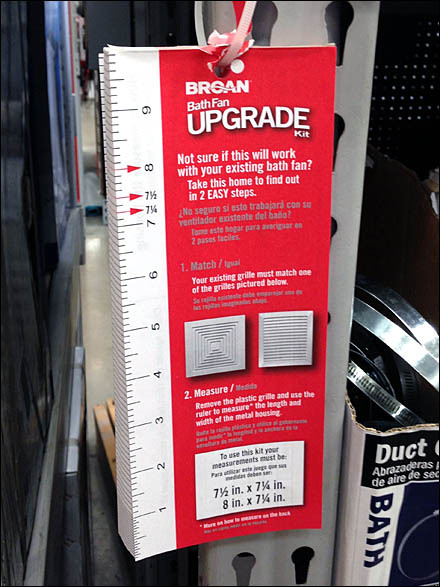 Hardware manufacturers … more shelf-edge tools like this please. And quickly. Margarit now wants to redo the decades old kitchen and master bath.